Canoes rest on the shore of Echo Lake in Echo Valley Provincial Park in the Qu'Appelle Valley in Saskatchewan, Canada. Canoeing is a favorite past time for many who come to Echo Lake during the summer months. 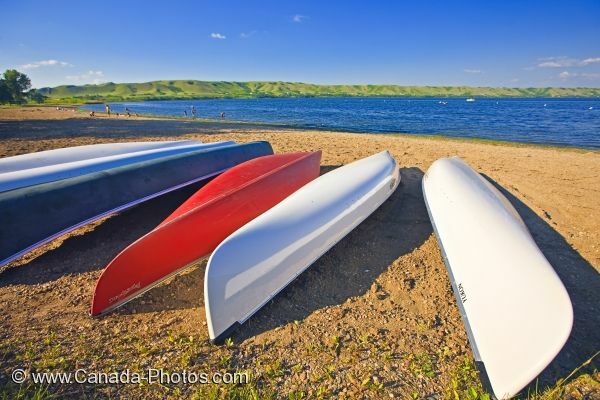 Along the sandy beach at Echo Lake in Echo Valley Provincial Park in the Qu'Appelle Valley in Saskatchewan, Canada lies a mass of canoes ready for action. Echo Valley Provincial Park is separated by two lakes, Echo and Pasqua which are both ideal for outdoor activities such as canoeing, kayaking, swimming, fishing and beach play. The canoes along the shores of Echo Lake can be rented where visitors can take to the water and explore the hidden areas located along the green, rolling hills. People can spend the day at the beach and relax while others like to enjoy some exercise while canoeing these waters. Echo Valley Provincial Park offers campsites which make Echo Lake easy to access with some campsites offering hot showers and electricity which are set up for RV's, campers or tents. Echo Lake is a popular summer holiday location especially for those who love canoeing. Picture of canoes available for those who love canoeing Echo Lake in Echo Valley Provincial Park in Saskatchewan, Canada. Canoes on the sandy beach of Echo Lake in Echo Valley Provincial Park, Qu'Appelle Valley, Saskatchewan, Canada.